At 4:45 p.m. on May 11, 1861, Cedar Falls ceased to be a frontier town. The first train arrives on the tracks of-the-Dubuque and Pacific Railroad. The Dubuque and Pacific, later the Dubuque and Sioux City and now the Illinois Central, came to Cedar Falls on the east side of the river. It had originally planned to cross the river at Waterloo and come into Cedar Falls near 19th and Main. A shortage of money led to a change in plan. Once the tracks reached Cedar Falls the-Dubuque and Pacific could sell its right-of-way land grant. It went faster to reach Cedar Falls on the level east side of the river, so the railroad finally chose that route. The railroad started west from Cedar Falls in 1864. An incident took place then that had a lasting effect on Black Hawk County. "In fact," wrote historian Roger Leavitt, "the whole future of the town turned on a few hundred dollars." The railroad wanted to build a bridge at Cedar Falls. This required the temporary closing of the millrace. Mill owners charged the railroad $300 a day for every day the water was shut off. The company had planned to make Cedar Falls the end of the division and the site of its shops. The $300 daily charge as angered the owners that they changed their plans. Waterloo, not Cedar Falls, became the site of the shops and the end of the division. Cedar Falls was the natural place for the division, according to Leavitt, as it was 100 miles from Dubuque. "When anger rules judgment departs," he wrote. "Had the shops been located here this would have probably been the larger town." 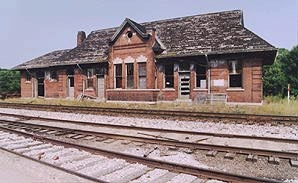 The Illinois Central Depot on North Main Street is a reminder of the important part railroads played in the development of Cedar Falls.